Tomorrow is August 23. 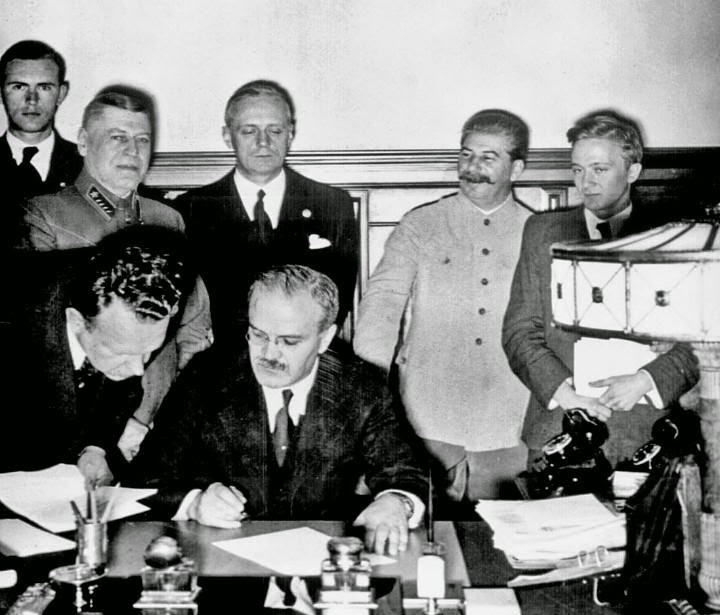 Some 75 years ago, the world was shocked to learn on that day that Nazi Germany and Soviet Russia had signed a non-aggression pact, many details of which remained secret. The pact bought time for the Nazis and the Soviets to mobilize and train more units, as well as consolidate their power bases for the showdown both Stalin and Hitler expected. It also partitioned Poland between the two countries, while granting Soviet Russia the right to annex the Baltic States. Most importantly -- critically -- it immediately revised the balance of power in Europe and the world in a way that forced every major Western power to reevaluate Hitler and his motives. The Molotov-Ribbentrop pact has gone down as one of history's great diplomatic coups -- or catastrophes -- overshadowed only because a week later, Hitler invaded Poland, precipitating World War II. The great lesson of the Molotov-Ribbentrop pact was that unscrupulous dictatorships are capable of forming short-term partnerships in order to advance their ambitions. Nobody in England, France, or America expected that Hitler would work together with Stalin. Pre-Holocaust, Hitler was known primarily for being a vehement anti-communist whose raison d'etre was that of the unpleasant but necessary fascist bulwark against Bolshevism and communism. So long as his territorial ambitions were pointed eastward, and lebensraum was a version of Manifest Destiny that came at the expense of the Soviet menace and not Europe, Hitler was tolerated, even admired. It seems we have forgotten this lesson. Our own diplomatic and foreign policy situation is rife with hypocrisy and inconsistency, and depends in many places on an assumption that unpleasant dictators will work in parallel to U.S. interest out of necessity or self-interest. This de facto policy -- maybe habit is a better word -- requires a great deal of time, attention, and money, investments we've become less and less willing to make in the wake of the twin disasters of Iraq and Afghanistan. Recently, we've been burned -- badly -- by bad intel, and a lack of understanding our enemies' motivations. Here are the top four situations where a "Molotov-Ribbentrop" type arrangement between people or groups we don't understand could turn troubled foreign policy areas on their heads. 1) Syria/Islamic State. There is already an understanding between the two groups, which helped the Islamic State's rise. Most intel analysts agree that over the last two years, while IS attacked al-Nusra, the Syrian Kurds, and what we call "moderate" Syrian rebel formations including the Free Syrian Army, Assad's regime made gains of its own. While the agreement or tacit arrangement between the two groups seems to be fraying, with Western planes attacking the Islamic State in Iraq, a return to the previous situation wherein neither group attacks the other seems likely. 2) Russia/China. The two historic rivals and aspiring superpowers recently signed an energy deal that gives both countries something they need -- for Russia, a market that doesn't depend on Western political agendas; for China, energy that comes free from American scrutiny. For decades, Western policy has relied on the historical enmity between Russia and China, plus their competing geopolitical ambitions -- were they to begin working together regionally, and cooperating more formally, it could signal ruin for American and Western energy interests across a broad swath of territory from Eastern Europe to the Middle East, as well as Western influence in Southeast Asia. 3) Iran/Turkey/Syria. When the Islamic State threatened American energy interests in Kurdish Iraq, America decided to intervene militarily, and the full consequences of that act have yet to manifest. One may well be to force an increasingly hard-line Iran and Turkey -- both of which have longstanding issues with Kurdish separatism -- into working together to crush Kurdish national ambitions. If Iran and Turkey were to take measures against Kurds in their area and in Iraq, it could result in America and the West being dragged into a nightmare scenario. 4) Iran/India. The relationship between Persia and India goes back quite a bit further than most countries', and ebbs and flows depending on regional threats and emerging opportunities. Iran could view Pakistan's ambitions to reassert their Taliban-governed client state as an unacceptable second extremist Islamic State on their eastern border, while India is witnessing an unusual amount of vitriolic anti-Muslim rhetoric from political leadership. An arrangement between the two countries in the event of a second Afghan collapse is not as farfetched as some might imagine. Adrian Bonenberger is a freelance journalist and author of Afghan Post. He served in the U.S. Army as an infantry officer between 2005-2012.